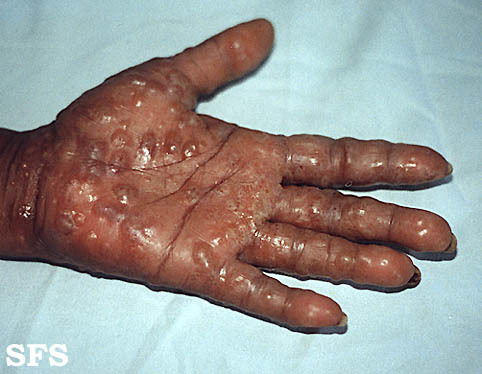 Dyshidrotic eczema, also known as pompholyx, is a type of eczema characterized by the presence of vesicles (small blisters) or bullae (large blisters) on the hands and feet. This is usually chronic – persistent or recurrent. These vesicles (less than 5 mm in diameter) or bullae (greater than 5mm in diameter) are not boils (abscess). Dyshidrotic eczema is not an infectious condition although it may occur in a person with a fungal or bacterial infection of the hand or feet. The rash is intensely itchy with vigorous scratching leading to rupture of blisters with cracking of the skin and fissures. It may appear an an independent entity or occur with atopic dermatitis or contact dermatitis (allergic or primary). It may also be associated with a number of systemic, non-dermatological diseases like HIV infection. Dyshidrotic eczema may occur either on the hands or the feet or both – the palms and soles are more often affected, often with extensive involvement of the fingers when it occurs on the hand. Milder cases may resolve before vesicles rupture and therefore cracking is avoided. These cases are more likely to be noticed on the hands. Due to the psychosocial impact of this type of skin disease on the hands, many patients will seek medical attention as soon as possible. However, it may be just as common on the feet although not noticed or even reported in the early stages. The exact cause of dyshidrotic eczema is unknown. It may be seen in up to 20% of patients with persisting skin diseases, particularly the other types of eczema, as well as in patients with skin infections. Prolonged tinea pedis (athlete’s foot – fungal infection of the feet) may result in dyshidrotic eczema both on the feet and hands although the skin of the hands are not infected. It is believed that dyshidrotic eczema is a combination of type I and type IV hypersenstivity reactions. Read more on types of allergic reactions. This is further supported by the presence of dyshidrotic eczema in asthmatics, patients with hay fever, after exposure to chemical like nickel (known sensitivity like with costume jewelry) and IV immunoglobulin infusions. It may also be seen in HIV positive patients (after asymptomatic phase) and those on highly active antiretroviral therapy (HAART). Dyshidrotic eczema may also be seen at times of emotional stress. Although not conclusively substantiated, it is only triggered by emotional stress in people with a history of allergic conditions (personal or family history of atopy) or existing tinea pedis. Therefore pre-existing contributing factors need to be present. It is also interesting to note that monozygomatic twins are equally affected by dyshidrotic eczema which indicates a genetic component, although this may be associated with familial atopy. In the absence of other pre-existing factors, contact dermatitis needs to be considered as it is widely associated with dyshidrotic eczema, especially in the chronic occupational setting. Food and drug-related allergies are less common but have also been noted as possible triggers of dyshidrotic eczema. What does dyshidrotic eczema look like? Dyshidrotic eczema, or pompholyx,is a type of skin rash (dermatitis) that is characterized by small to large fluid-filled blisters known as vesicles or bullae respectively. It is an itchy skin condition that often arises in the presence of other skin or systemic diseases. Scratching excessively and rupturing of the blisters leads to cracking of the skin and the formation of fissures that can be painful. This carries the additional risk of a secondary bacterial infection leading to oozing and further inflammation of the skin. 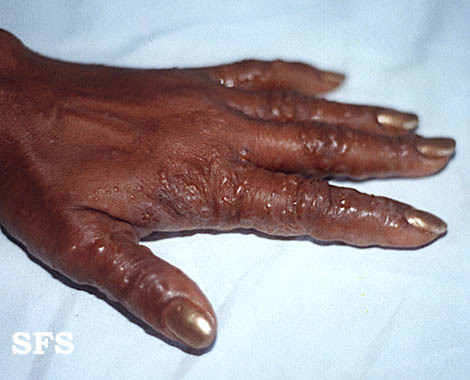 Dyshidrotic dermatitis arises on the palms of the hands and soles of the feet. In the early stages, the blisters on the feet may go by unnoticed and patients often find the rash on the hands more distressing. The blisters may also extend to the sides of the fingers and toes (lateral aspects) without underlying inflammation and redness of the skin (eyrthema). With an infection, pustules with a yellowish discharge may develop alongside the clear fluid-filled vesicles or bullae. Various deformities of the fingernails may be seen in more severe or long standing cases as is described under fingernail ridges, thickened fingernails and discolored nails. Changes in the nails may also be related to a fungal infection (onychomycosis) with overlapping dyshidrotic eczema. Other skin symptoms may be related to underlying conditions, particularly atopic and contact dermatitis as well as dermatophyte (fungal) infection. Many of these features overlap though, like fissures between the fingers and toes, which is seen with a fungal infection and peeling of the skin (desquamation) in contact dermatitis which also occurs in dyshidrotic eczema without any of these underlying skin conditions existing. Read more on types of eczema. 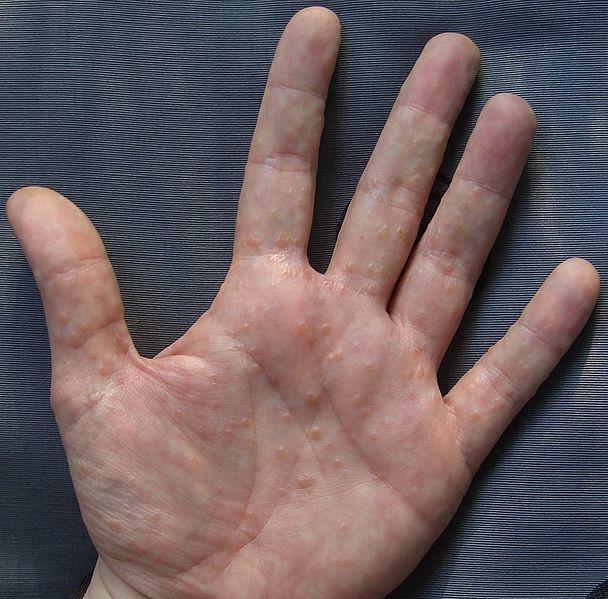 Picture of dyshidrotic eczema with vesicles on the palms. Sourced from Wikimedia Commons. 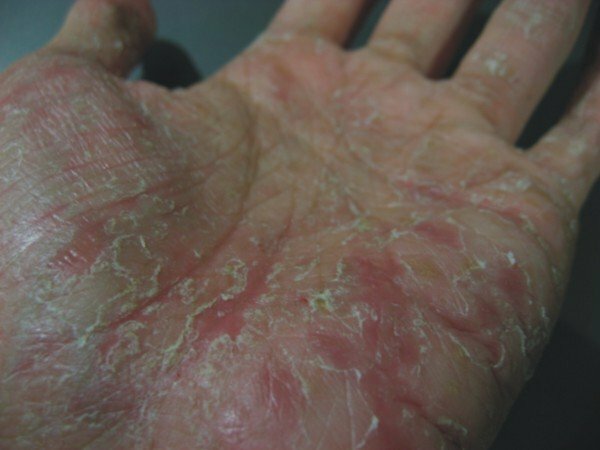 Picture of dyshidrotic eczema on the palms with peeling of the skin. Sourced from Wikimedia Commons. Picture of Severe dyshidrotic eczema with large blisters. Sourced from Dermatology Atlas (atlasdermatologico.com.br). Picture of dyshidrotic eczema blisters on the fingers. Sourced from Dermatology Atlas. Picture of severe dyshidrotic eczema on the fingers. Sourced from Wikimedia Commons. Picture of dyshidrotic eczema on the feet with excoriation. Sourced from Wikimedia Commons. Picture of dyshidrotic eczema on the soles of the feet showing peeling and excoriation. Picture from Wikimedia Commons.